KENYA -- In the Saiya district of West Kenya, 250 churches are using Dr. Wagner's books at the request of their Bishop, Joseph Wasonga. Because of generous donations, CMM has provided Bible study books at no charge. The study of these books has motivated believers in the Saiya churches to organize a missionary effort to other churches in an even poorer area of Kenya, 300 miles to the north. Also, in Kisumu, Kenya, through relief projects of ACTS, CMM has provided financial aid to orphans and widows who have been left destitute because of AIDS. UGANDA -- Dr. James Butare is starting a new school for pastors who cannot afford extended education. CMM has provided substantial funds to help in this effort. CMM has also provided printing facilities for Cornerstone Vocational Institute, located in Kampala and directed by Dr. James Butare of Wycliffe Bible Translators Australia. At CVI, young people, mostly orphaned by AIDS, will be trained in printing, sewing, and carpentry. Dr. Butare also oversees the translation of Dr. Wagner's four-volume series, Become the Person God Meant You to Be, into his native language, Kinyarwanda. In Kampala, the translator, John Mitubishu, supported by donations from CMM, has finished translating all four volumes and now is helping churches in Rwanda study these teachings. These books are also being translated into French so that they can be used in western french speaking countries. RWANDA -- CMM has provided free copies of the three translated books to a number of pastors in Rwanda. 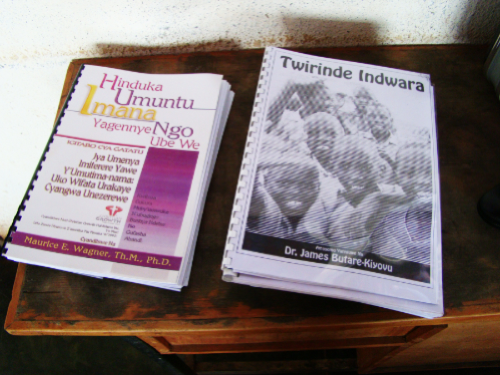 These books, the first Bible studies available in their heart-language of Kinyarwanda, were chosen by Dr. Butare, himself a Rwandan, because he believes that they will help his people to find a new identity in Christ and, thus, to rebuild their society after the horror of the 1994 genocide. The books are used for both Bible study and literacy training.